There isn’t a better way to begin this series of Celebrate Broadway compilations than with this show-stopping collection of songs guaranteed to make you feel terrific. All of these songs, whether they’re from hit shows or (let’s be delicate about this) less-than-successful ones, have one thing in common: they’re happy! Flora, the Red Menace (“Sing Happy”) marked the Broadway debut of Liza Minnelli and the songwriting team of John Kander and Fred Ebb. Ms. Minnelli won the first of her three Tony Awards® for this role of a young fashion designer caught up in the Communist movement of the ’30s. The show opened on May 11, 1965, and played for only 87 performances. Kander & Ebb went on to write (among others) Cabaret, The Happy Time, Zorba, Chicago, Woman of the Year, Kiss of the Spider Woman, as well as a revue of their songs entitled And the World Goes ’Round. This song let Broadway and the world at large know that a new star was born. The 1987 Lincoln Center Theater revival of Cole Porter’s great musical Anything Goes was directed by Jerry Zaks and starred Patti LuPone as Reno Sweeney, Howard McGillin, and Bill McCutcheon who won a Tony Award® for his hilarious deadpan portrayal of Moonface Martin. In “Blow, Gabriel, Blow” Ms. LuPone raises the roof of the theater belting out one of Porter’s greatest numbers. In 1975, the musical version of the popular film Shenandoah won Tony Awards® for its powerful anti-war book and for its leading actor John Cullum. The show ran for 1,050 performances and this winning duet (“Freedom”) had audiences cheering at every performance. Lionel Bart’s popular musical Oliver! opened on Broadway on January 6, 1963, after an extensive national tour. It was already a huge hit in London and the Broadway cast recording was made in Los Angeles prior to the show’s arrival in New York. By the time the show did open, “Consider Yourself” was already a popular song with audiences. The show won three Tony Awards® that year, for Scenic Design (Sean Kenny), Conducting (Donald Pippin), and Best Musical Score (Lionel Bart). This musical version of J.M. Barrie’s classic Peter Pan played on Broadway for 152 performances. 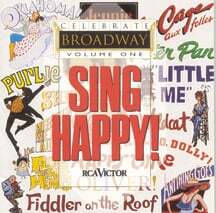 It starred Mary Martin and Cyril Ritchard who both won Tony Awards® for their performances. While the show was successful, it’s the television version of the show (available on video) that has permanently etched it in the consciousness of children and adults for two generations. In 1967, when Hair opened off-Broadway as the inaugural attraction at Joseph Papp’s New York Shakespeare Festival Public Theater, the world of the musical was changed. Six months later the show moved uptown to the Biltmore Theater and for 1,758 more performances Broadway let the sun shine in. It may seem dated now and perhaps even naïve, but back then it was revolutionary. Oklahoma! started a revolution of its own in the musical theater. Its initial run on Broadway was for 2,248 performances. On its 50th anniversary on March 31, 1993, prior to a preview performance of The Who’s Tommy, the legendary John Raitt, who starred in the first national tour of Oklahoma!, took to the stage of the St. James Theater where Oklahoma! had played for seven years and serenaded the audience with a smashing version of Rodgers & Hammerstein’s title song. The youthful rock-oriented audience gave him a standing ovation. The ovation for a star, a show, and a song said more about the enduring appeal of Broadway than a library full of books. Mary Martin had a rare failure in Jennie, the musical version of the life of the great actress Laurette Taylor. However, the score by Dietz and Schwartz is exuberant on its own and is a reminder that a show doesn’t have to be good to have good tunes. Stephen Sondheim composed what is his most traditional and in some ways most challenging score for this musical version of Kaufman and Hart’s Merrily We Roll Along. The show ran a scant 16 performances on Broadway but the recording (made the day after the show closed) has inspired theater productions throughout the world. “Our Time” is Sondheim’s joyful anthem to youth and optimism. In 1960, after the breakup of her marriage to Desi Arnaz, Lucille Ball came to Broadway in Cy Coleman and Carolyn Leigh’s Wildcat. Like Jennie, the show proved to be inferior to its star, but sometimes a star (especially one like Lucy) and a song like “Hey, Look Me Over!” are enough to make an evening worthwhile. On January 16, 1964, Hello, Dolly! opened at the St. James Theater to run for 2, 844 performances. It won ten Tony Awards® and the hearts of literally millions of theatergoers the world over. Jerry Herman’s sparkling score is simply the quintessential American musical comedy. In “Before the Parade Passes By” Carol Channing, the original Dolly, makes a life-affirming promise that is at the heart of almost any Broadway musical. When Purlie opened on March 15, 1970, at the Broadway Theater, two stars were born overnight: Cleavon Little and Melba Moore. Both won Tony Awards® for their performances in this lively musical that also helped to bring black audiences to the theater – many for the first time. The show’s score (by Gary Geld and Peter Udell) was a combination of gospel, soul, country, and traditional show music, which gave audiences reason to cheer for all of its 688 performances. One of the greatest musicals of all time, Fiddler on the Roof (Jerry Bock, Sheldon Harnick, Joseph Stein) was directed by Jerome Robbins and starred the one and only Zero Mostel. It won ten Tony Awards® and most every other prize imaginable. It was for many years the longest-running musical in history (3,242 performances), and has been revived on Broadway no fewer than three times. “To Life” captures the essence of Mostel’s vibrant performance and one only has to close one’s eyes to imagine Robbins’s bold and striking choreography. On February 15, 1967, The Happy Time opened to mixed reviews at the Broadway Theater. In June of that year it won Tony Awards® for its star Robert Goulet and direction and choreography by Gower Champion. The underrated score by Kander and Ebb contains some of their most lyrical work. In the warmhearted “A Certain Girl” Goulet is joined by co-stars David Wayne and Michael Rupert in a delightful old-fashioned show-stopping trio. Sid Caesar came to Broadway on November 17, 1962, in Little Me, a rollicking musical comedy with a book by Neil Simon, music by Cy Coleman, and lyrics by Carolyn Leigh. Caesar’s co-stars were veteran performer Nancy Andrews and newcomer Virginia Martin, who played the older and the younger Belle Poitrine, respectively. Here in “Little Me” the two “Belles” sing of their belief in themselves. After closing in San Francisco in 1958 under a different title (At the Grand), Grand Hotel, The Musical finally made it to Broadway in November 1989. Under the inspired direction of Tommy Tune, the wait proved to be worthwhile. The show won five Tony Awards®, including one for the diminutive Michael Jeter, featured here with Brent Barrett in the double-barreled high-flying Charleston number, “H-A-P-P-Y/We’ll Take a Glass Together”. La Cage aux Folles is in every sense of the word an old-fashioned musical. It has a book by Harvey Fierstein, a score by Jerry Herman, direction by Arthur Laurents, sizzling choreography by Scott Salmon, and three exotic costume changes in the opening number alone! It had no workshop or regional theater productions, but instead went the old-fashioned route of a pre-Broadway tryout in Boston, where critics and audiences took the show to their hearts. The response on Broadway was no different when the show opened on August 21, 1983, at the Palace Theater. It won six Tony Awards® including Best Musical, Book, Score, Direction, Costumes, and of course Best Actor went to George Hearn for his thrilling performance as Albin. “The Best of Times” is one of the happier songs to be written for the Broadway stage in recent years and a perfect way to end this first volume of theCelebrate Broadway series. There isn’t a better way to begin this series of Celebrate Broadway compilations than with this show-stopping collection of songs guaranteed to make you feel terrific. All of these songs, whether they’re from hit shows or (let’s be delicate about this) less-than-successful ones, have one thing in common: they’re happy!